Descending the steep, narrow plank, inch by inch, hand over hand along the long pole, I thought: “This better be one hell of a cave!” Exploring the other-worldly interior of Hang Trong Cave was to be one of many surreal experiences I was to have traveling along Ha Long Bay in northeast Vietnam. 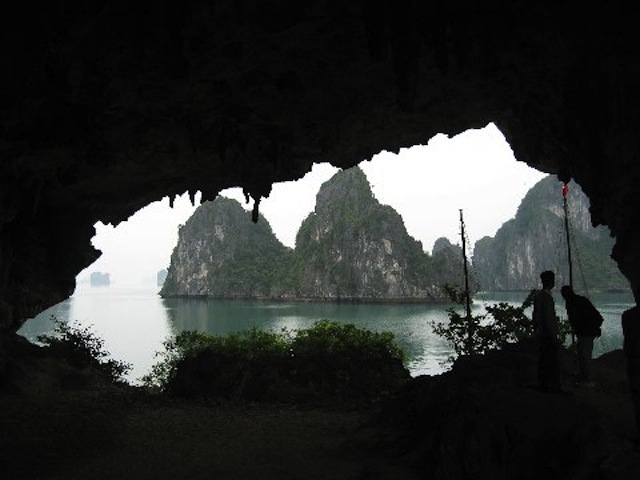 In the 1992 movie Indochine, credited with putting Ha Long Bay on the map, Catherine Deneuve describes it as “the most remote outpost of Indochina.” Today, the bay still retains that end-of-the-Earth, Lord-of-the-Rings-on–water quality. The almost 600 square miles comprised of thousands of karst islands, caves and inlets, which we visited as part of a trip with Myths and Mountains tour company, create a solitary natural environment that belies description and inspires awe. I kept thinking how many times can I use the word surreal in one travel article? The boat we called home, replicating an old Chinese Junk, was basic, but we dined well and huddled about the crew as they studied tidal charts to determine our daily itinerary. Inflatable canoes, powered by guides, were our vehicle of choice for purposes of exploration. Cave opening too small to navigate? No problem –- just let some air out of the canoe. Very versatile. Some caves were so dark we donned headlamps to maneuver through. Others so small, the entire trip was negotiated on our backs. But those that enthralled the most were comprised of tortured, grotesque shapes hanging from the ceiling and reflected in the water below. I felt stuck in a huge open mouth badly in need of dental work; I was Jonah inside the whale, the cave itself its gaping jaw, and the jagged stalactites above and below giant misshapen teeth. Some days we paddled into the caves. Others we trekked through them. One-hundred-forty steps up a sheer cliff brought us to Hang Sung Sot -– the over-100-foot-high, multi-chambered Surprises Cave -– which indeed it was full of. Some chambers were back lit by sun-filled gaps in the limestone, others artificially lit for dramatic effect. I was told the name referred to the enormity of the cave –- a mile and a half walk from end to end; for me it was the huge highlighted outcropping protruding at a suggestive 45-degree angle as you rounded one of the bends, clearly a pornographic symbol that elicits giggles -- if not outright guffaws – from all who come across it. I could envision a small civilization existing here in a former lifetime, and was not surprised to hear that many Vietnamese hid in the caves during the bombings of Hanoi during the Vietnam War -– or, as they see it, the American War. Very candid about the good and bad in his country and the pros and cons of the government, his perspective on the current political climate in Vietnam was also interesting. Although the government is Communist -– what Cuong describes as “flexible communism” -- the burgeoning economy reflects capitalism. “Perhaps you can smell democracy in the air but it’s going to be a while before it settles to the ground,” he observed. But back to paddling through Ha Long Bay. Exiting the caves often brings you into a still lagoon, mirroring the multiple majesty of the soaring peaks. Jagged and ragged, alternately solid and porous, the gauzy spires seem lost in the horizon while alternately sinking below the surface of the water. Being of a certain age -– and eyesight -– I thought perhaps the surroundings appeared that way because of my cataracts –- all filmy and out-of-focus. But it is more valid vista than vision -– and therein lay their beauty. Back aboard our floating home, we traveled past a complement of water-borne vehicles that challenged the imagination: multi-colored fishing boats sporting multi-faceted protrusions; floating houses on wooden platforms with shrimp, crab and fish farms caged underneath; bamboo basket boats, and rowboats and kayaks manned by kids playing hide-and-seek behind the small islands in the Bay. A young woman in a basket boat pulled up alongside ours selling chocolate, crackers, cookies, nuts, wine and cigarettes. Somehow all that junk food seemed appropriate considering the nature of our boat (Need I remind you we were on a Chinese Junk…?). Relaxing on deck, we play the ancient game of what do you see in the strange formations in our midst. 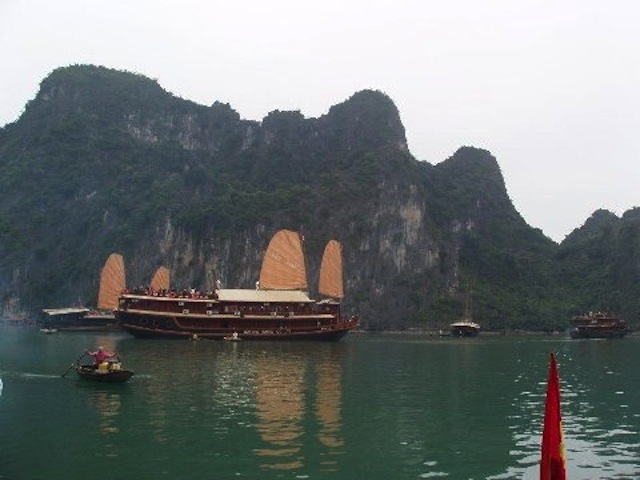 Or, more appropriately on Ha Long Bay …mist. “Hey, that looks like George Washington,” “Nah, a fisherman,” “No, I think it’s a goat’s head” until the boat moves on to the next imaginary challenge.